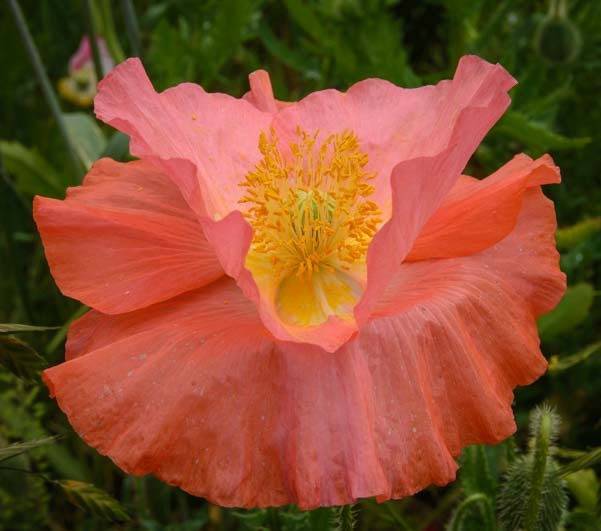 Blue Ridge Parkway (North Carolina) - Wildflowers Everywhere! 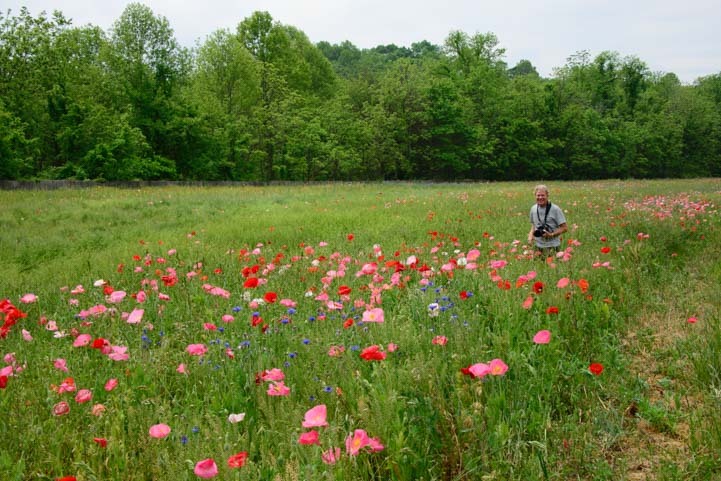 Blue Ridge Parkway (North Carolina) – Wildflowers Everywhere! 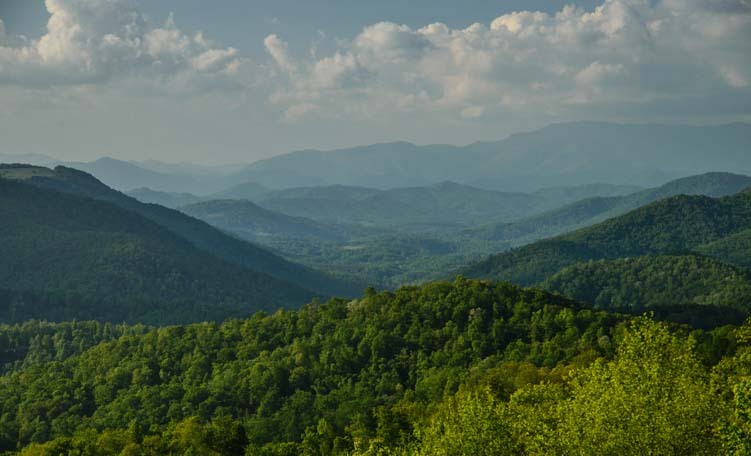 May, 2015 – The south end of the Blue Ridge Parkway is in Cherokee, North Carolina, right next to the Newfound Gap Road that traverses Great Smoky Mountains National Park, and we enjoyed some wonderful views at the beginning of this scenic drive. Motorcycles were everywhere, but this is a road that would be great for cycling too because, even though there’s no shoulder, there’s very little traffic. There are so few vehicles on this road, it makes for good cycling. Two tunnels at the south end make it best for tall RVs to find an alternate route, but they are neat to drive through in something smaller! Spring was in full bloom and we saw lots of wildflowers. 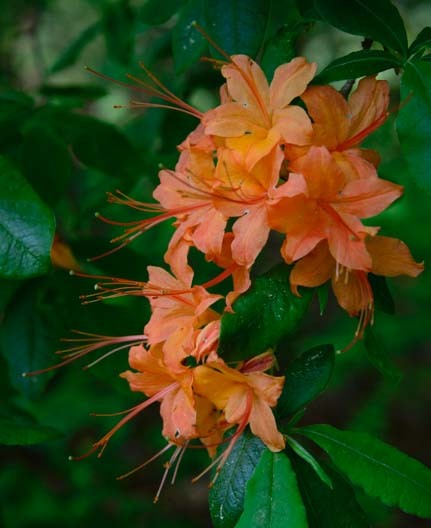 White trillium and huge bright orange azaleas were blossoming on either side of the road, as well as some pretty pink flowers. 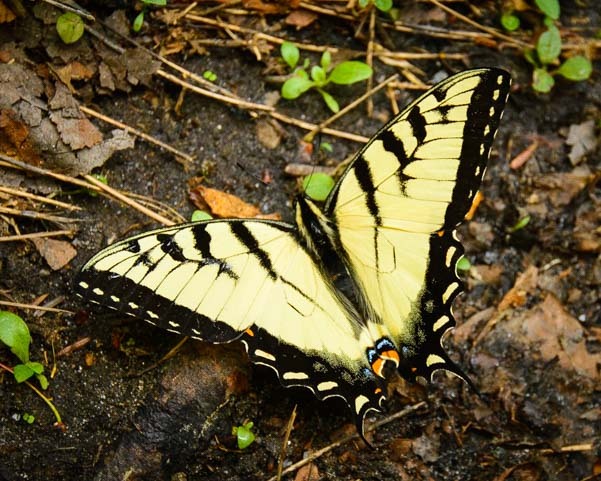 Down at our feet, while tromping around at an overlook, we spotted a big yellow butterfly. He flew off when a matching butterfly landed nearby. We watched several of these guys flying around…and this one landed by our feet. The Blue Ridge Parkway was built between 1935 and 1983 to give people a way to travel along the crest of the Blue Ridge mountains and enjoy their ethereal beauty without interruption between Great Smoky Mountains National Park to the south, in North Carolina, and Shenandoah National Park to the north, in Virginia. It is a narrow ribbon of protected land that threads its way across these two states, from the southwest to the northeast. Ironically, because much of the road is lined with tall trees, it is often impossible to see across the valleys! At many overlooks the trees have grown so tall since the time the overlooks were constructed that you can’t see the view at all. Looking past the sign that says “Overlook” all you see is trees! But every once in a while the vistas open up, and the views are lovely. Although many overlooks have no view, occasionally a stunning one opens up. Oddly, driving through all these twists and turns under an endless archway of trees can get a little tedious after a while, since the views rarely change (in the fall, however, I imagine the colors are extraordinary). 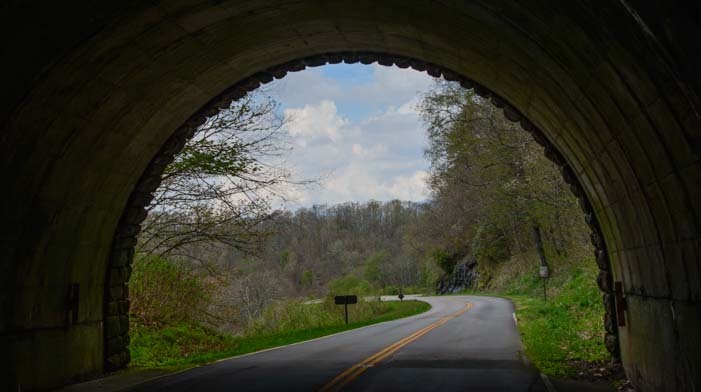 So, we hopped on and off the Blue Ridge Parkway as we snaked our way north, enjoying the activities, small towns and hum of life that goes on alongside it. 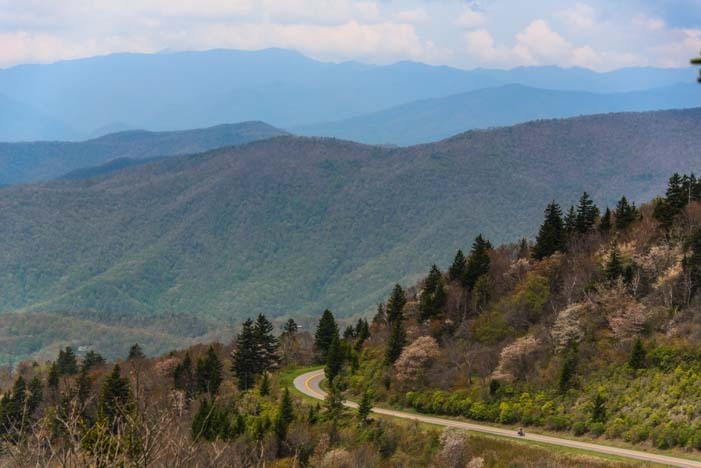 Even though the Blue Ridge Parkway is part of the National Park System, just like Great Smoky Mountains National Park, there is no fee to enter or drive on it. It intersects other roads frequently, and in many places the locals use it as a shortcut from here to there. At one point in our travels on and off the parkway we found ourselves on I-40 just west of Asheville, North Carolina. 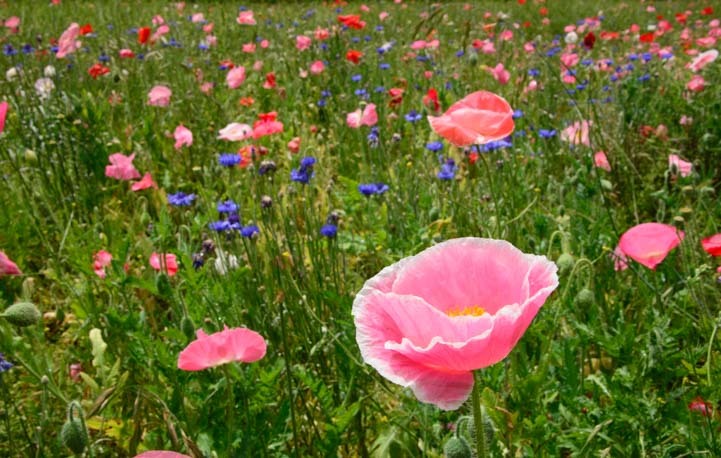 We were zooming along on the freeway when we suddenly saw a massive field of wildflowers at the side of the road. Mark slammed on the brakes (yay for our new trailer disc brakes!) and pulled off the highway. The wildflowers were just stunning. 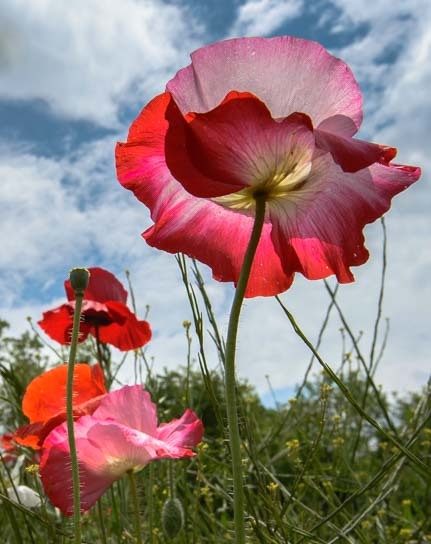 We’ve seen so many photos of fields of wildflowers over the years, and we’ve always dreamed of taking wildflower shots where the land was blanketed in color. But where are those photos taken? 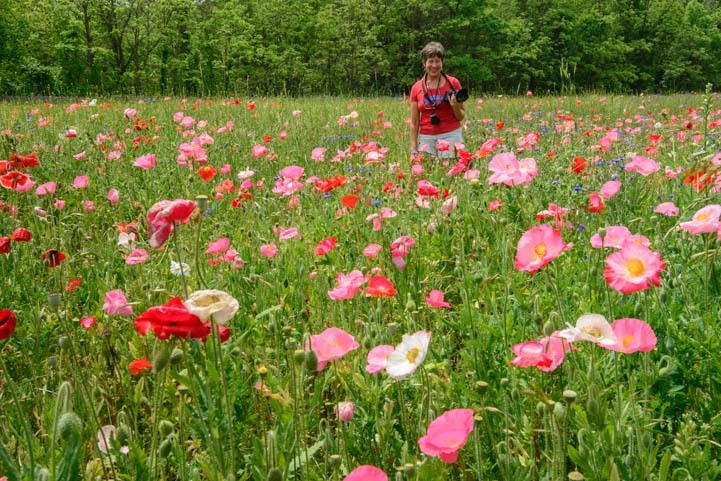 We just don’t see fields of wildflowers in our travels like some people manage to get in their photos. All shades of pink and red! 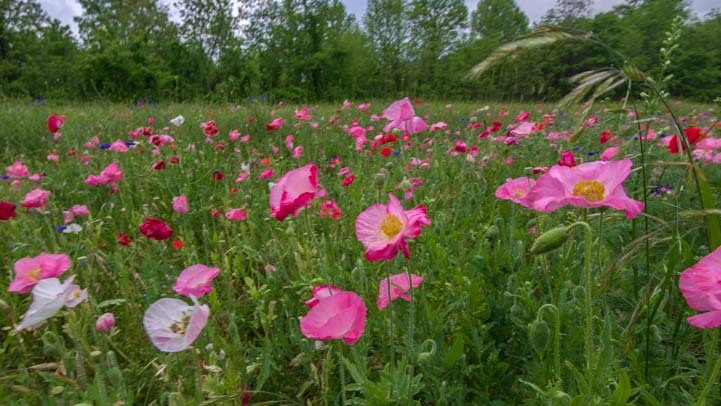 Well, I guess one huge field of wildflowers can be found on the eastbound side of I-40 just west of Asheville, North Carolina! There were even a few blue flowers in the mix! We were thigh deep in flowers and loving it! 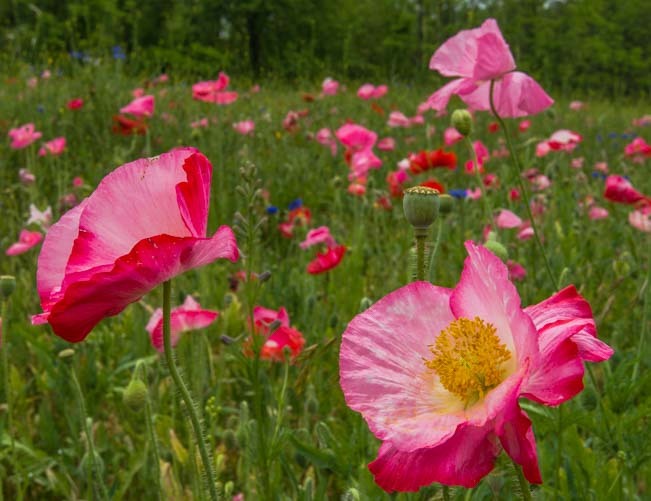 I don’t know what kinds of flowers these were, but they were blooming in all shades of pink, red, white and peach. As the cars flew by us on the highway, all in a rush to get somewhere else, we stayed in this spot for over an hour enjoying this glorious display of Nature’s handiwork. 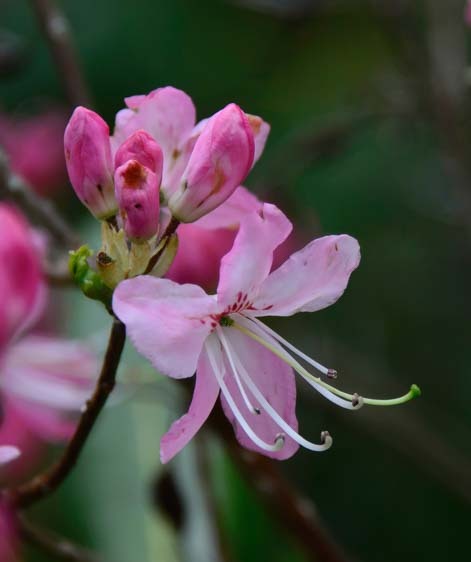 Many people drive the Blue Ridge Parkway to enjoy the vivid display of rhododendrons that happens every spring. 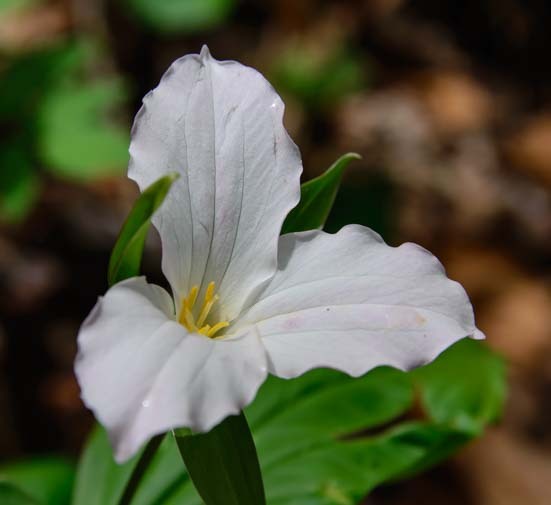 But we discovered that spring is a great time for flowers in other places in North Carolina too, even out in the wilds of I-40! 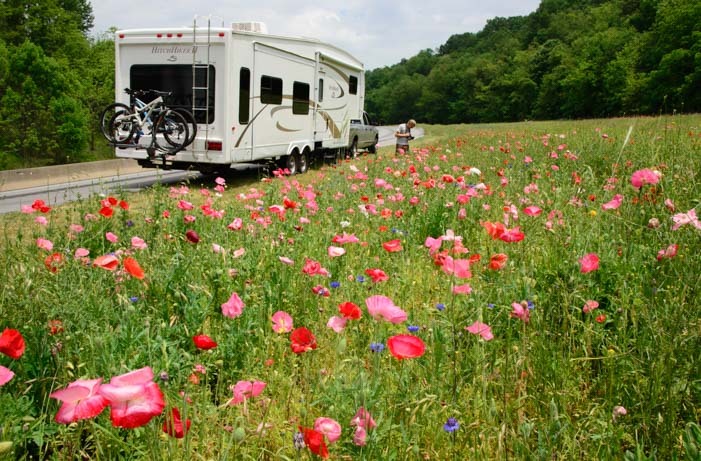 If you want your rig surrounded by wildflowers, the Blue Ridge Parkway is nice — but try I-40 too! 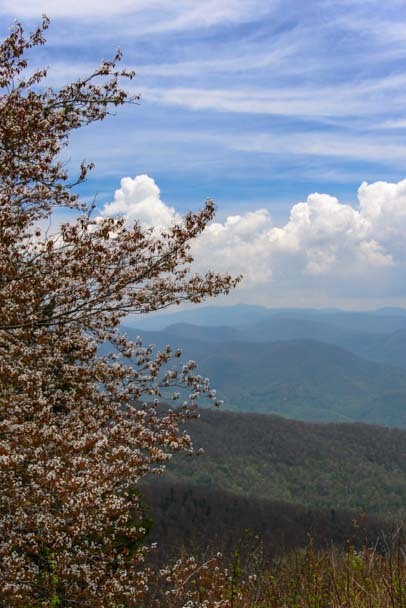 This entry was posted in North Carolina and tagged New, North Carolina, Smoky Mountains Blue Ridge Parkway, Top Scenic Drives, Travel, USA, WP Travel by Roads Less Traveled. Bookmark the permalink. We plan on taking this route next year and I’ve read about the low clearance in a couple of the tunnels. Did you have to go around any of them? Our trailer is 13′ high and I did read somewhere that for a fee they would stop traffic so you could go right down the middle. Any truth to that? 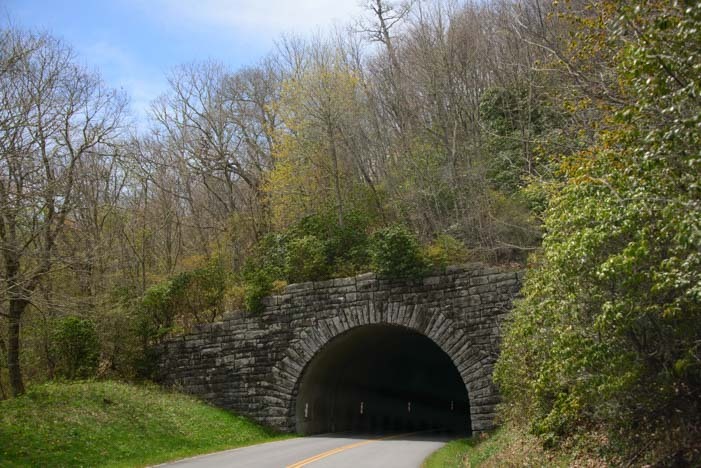 The southern part of the BRP has two tunnels that we felt were too low for our trailer (12’6″). Maybe they’ll stop traffic, but we didn’t see anyone anywhere on the road that would do that. Perhaps it’s different during high season in the fall. There are a lot of roads in the area where you can take an alternative route. I’d suggest enjoying that southern part in your truck and then getting on the BRP with your trailer north of those two tunnels. 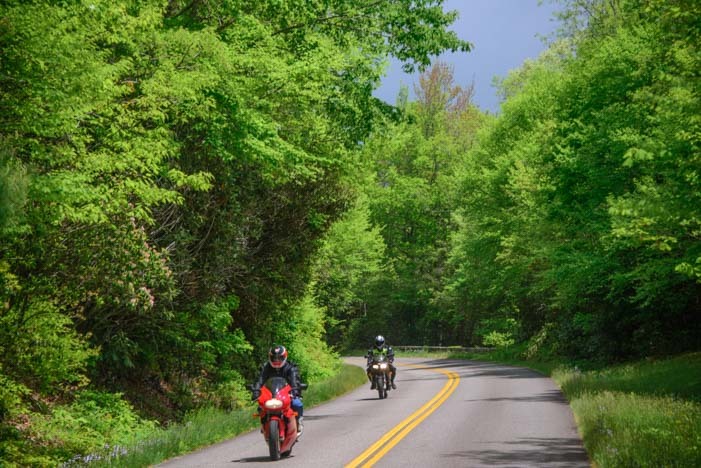 Another beautiful southern parkway when the dogwood, redbuds, magnolias, and wildflowers are in bloom is the Natchez Trace Parkway in Tennessee. We drove the parkway for several weekdays this past April and we were one of a very few RVs using it. In addition, there were so few cars on it at that time of week that a bicycle tour provided the majority of the first day’s oncoming traffic. That lack of traffic was nearly as enjoyable as the scenery and history since we had just picked our new 5th wheel and were still learning how different it is from towing our small travel trailer! We loved our travels on the Natchez Trace Parkway in Mississippi and have been there twice (blog posts here: https://roadslesstraveled.us/natchez-trace-2/ and here https://roadslesstraveled.us/natchez-trace-1/). 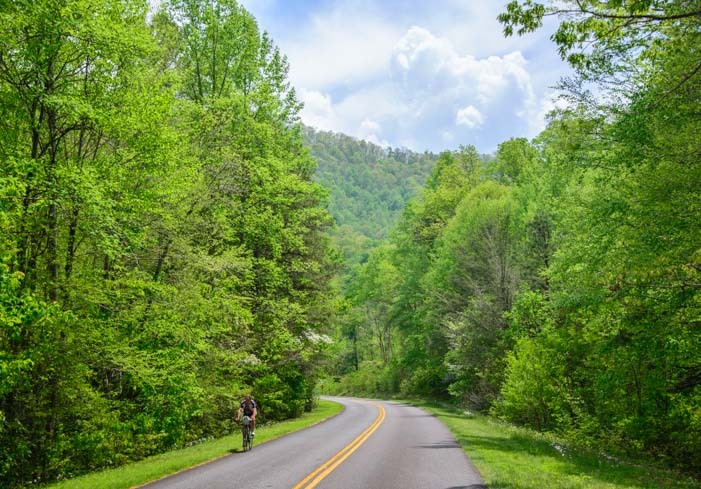 What a great area to ride a bike — and to learn how to tow your fifth wheel! !